They've just finished an extensive restoration, all the better to show off the 50,000 items, ranging from the sublime to the ridiculous, amassed by hoarder extraordinaire Frederic Marés (1893–1991). Marès was an accomplished sculptor—you'll see some of his monumental works in Plaça de Catalunya—and he spent almost all the money he made on his collections. Here, he concerned himself not only with important works, but also the objects of everyday life—everything that was part of his own personal universe. The museum occupies the part of the royal palace where King Ferdinand installed his dubious gift to Barcelona—the Spanish Inquisition. It later became the Reial Audiència, or Royal Law Courts, and then a convent. Incredibly, as big as it is, it contains only a fraction of Marès' collections; some of these fill up four smaller museums around Catalonia, while others are on loan around the world. On the ground floor, armies of tiny Iberian ex-votos, each figure touchingly distinct, are followed by Roman, Greek and Iberian busts, coins and tombs. Then comes the largest collection of sculpture in Spain: an astonishing array of 12th–14th-century polychrome wood sculptures of sweet-faced Virgins and room after dizzying room of stylized crucifixes that seem to erupt from the walls simultaneously in a Dali-esque nightmare. The basement is devoted to a beautiful collection of Romanesque and Gothic sculpture, with an impressive 13th-century portal, capitals and columns, and a scattering of early tombs, including that of a 14th-century knight bearing a lovingly sculpted hawk on his left hand.There's more gore on the first floor, with flayed and bleeding medieval saints punctured with arrows (one of the best pieces here is a 12th-century relief of the Vocation of St Peter). From there it's on to the 19th Century. Here, the Baby Jesuses have real hair and dolly faces, intermingling with Spanish masterpieces, a famous collection of Catalan iron, Montserrat memorabilia and colourful plaques of the Dance of Death, showing the Grim Reaper reeling with ladies, monks and peasants. Your brain, in fact, will begin to reel as you venture upstairs to the second floor, into the 16 rooms of Marés’ ‘Museu Sentimental’ swollen with scissors, fans, giant cigars, little lead Moorish and Christian soldiers and every kind of 19th-century flotsam and jetsam from sea shells to door knobs. 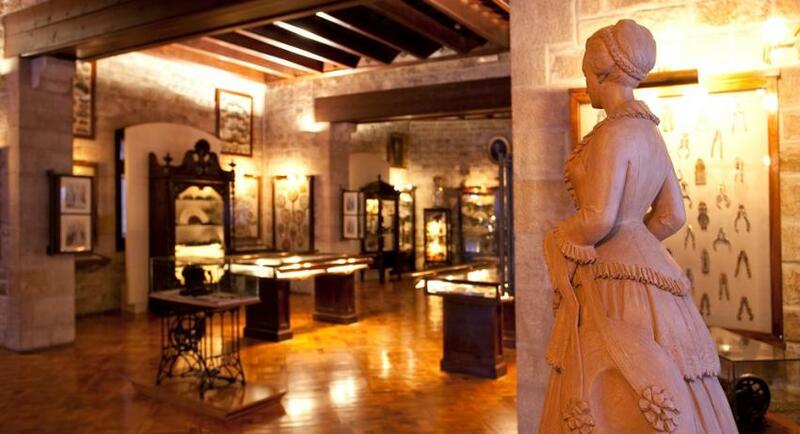 Marés’ study has been left just as he liked it, although now it, too, is crammed with his sentimental sculpture. On the top (third) floor, the Entertainment Room, despite its enticing title, holds only dolls and early bicycles. Here, some steps lead to a tiny viewing gallery, where you can gaze down into the majestic throne room (Saló de Tinell) in the adjoining Palau Reial. In the cool, vaulted courtyard by the entrance, orange trees fill the air with scent, next to a charming outdoor café, the Café de l'Estiu, perfect for dizzy museum victims.